Ready-to-use molecular weight marker, designed for fast size determination of nucleic acids from 100 bp to 2000 bp. Agarose gels are often run to check and see if a band is present or not, for example in a PCR reaction. With 5 regularly spaced bands, ranging from 100 bp to 2000 bp, EasyLadder™ I is a molecular weight marker especially designed for fast size determination of linear double-stranded DNA fragments on 0.5% to 3% TAE or TBE agarose gels. This ready-to-use format, with a red loading dye already added to the ladder, reduces handling steps and saves time; simply transfer EasyLadder I from the vial to the gel, along with the PCR product and run at high voltage for just a few minutes (1-3 cm of a gel lane). 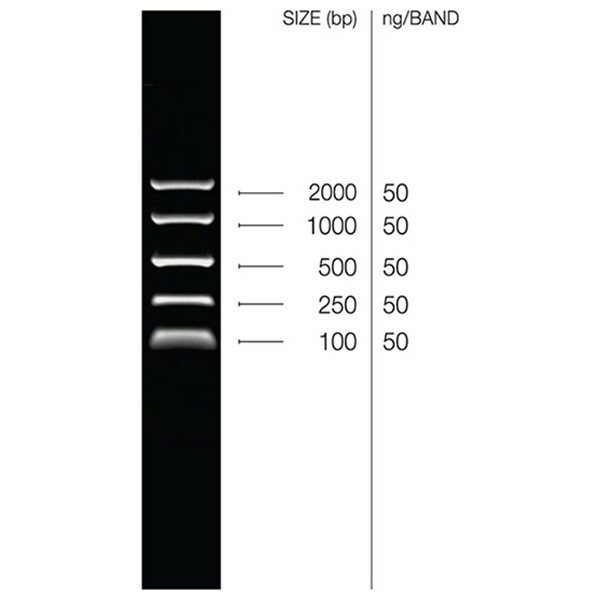 The concentration of DNA in each of the EasyLadder I bands is provided for optionally determining the approximate mass of DNA in comparably intense sample bands of similar size. The EasyLadder I is also supplied with a 5x loading dye for the loading of sample DNA. Please refer to the HyperLadder Selection Chart to confirm the EasyLadder I is the most suitable kit for your application. All components should be stored at -20°C upon receipt for optimum stability. Repeated freeze/thaw cycles should be avoided. When stored under the recommended conditions and handled correctly, full activity of the reagents is retained until the expiry date on the outer box label. Which kind of tracking dye does the ladder and the related loading buffer contain? The EasyLadder and the related red DNA loading buffer contain cresol red. The HyperLadder and the related blue DNA loading buffer contain bromophenol blue.